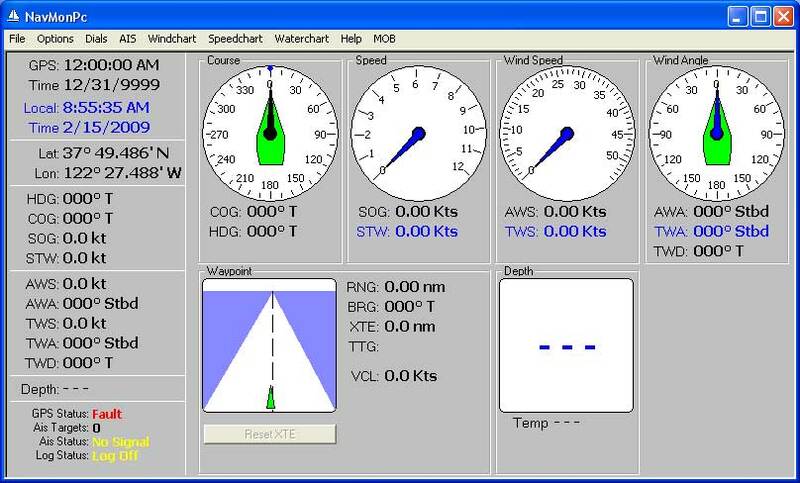 Last year I mentioned my NMEA logger program (Windows), that captures, logs, plays, displays (etc) NMEA 0812 data. It provides dial displays of most data, as well as AIS display/alarm, depth alarm, MOB alarm, stripcharts, etc. I took it to Hawaii and back during the ’08 Pac Cup and have been bugfixing and feature-creeping since then. IMHO, it’s pretty useful. You are welcome to use it for free, and I would welcome any constructive comments. I do not intend to add chart-display. The screen is optimized for the (tiny, low power) EeePc, but it works fine on larger computers. In particular, I would appreciate any NMEA capture files you might generate, so I can test it on other people’s data. I almost forgot: This is free, support is not guaranteed, in fact, nothing is guaranteed. It doesn’t hurt to ask, though. This entry was posted on Sunday 15. February 2009 at 14:11 and is filed under: AIS. You can follow any responses to this entry through RSS. Responses are currently closed. | Trackback URI.